Birds and observations that have been entered in the BirdRing app can be imported into the Marked Birds Database. This blog post describes in detail how this feature works. The features described here are based on the Marked Birds Database version 2.1.0. Compared to earlier versions, much has changed. The BirdRing import uses the CSV file from the BirdRing app to automatically create new birds and observations in the database when these birds do not yet exist. For birds that do already exist, the observation is automatically added. This saves a lot of time compared to doing this manually. You send yourself the file from the BirdRing app by e-mail and save that file somewhere on your system. This will be a CSV (comma-separated value) file with the extension .csv. 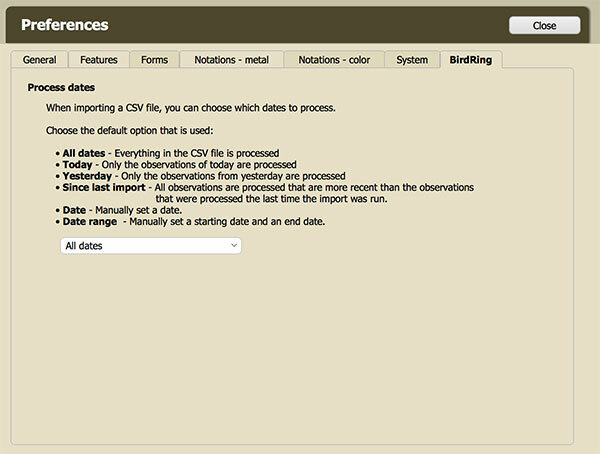 In the MBDB, you choose the version of the BirdRing app from which the CSV file was exported. You choose the CSV file to import. You choose the date(s) that should be processed. The CSV file is processed: the system checks if any of the birds in the CSV file already exist in the database. The results are shown for each individual bird. Where needed, you add additional information about the rings and/or observation. You import the birds and/or observations into the system. To make this feature work properly and in parts make it work automatically, some preparation is needed before you start importing CSV files. When selecting a bird species in the BirdRing app (probably in your own language), a code that represents this species is also stored. This code is used by the database to identify the species. It is therefore important that these codes are set up in the database before the import is started. Do this by going to Manage MBDB > Bird Species and opening the window for all species that you regularly observe (add it if it does not exist yet). Fill in the code in the ‘Euring Code’ field. A link to the page where you can get the codes from on the Internet is available next to the field. Important: Remove any starting zeros from the code. For example: 01360 should be entered as 1360. Reason: the Euring code always consist of 5 numbers, ranging from 00000 to 99999. Some numbers may start with one or more zeros. However, the zeros at the beginning of the code are not present in the CSV file. When the code in the MBDB does not exaclty match the code in the CSV file, the species will not be recognized. When entering an observation in the BirdRing app for a bird that is fitted with a color ring, it is very likely that the bird is also fitted with a metal ring. However, it is not always possible in the BirdRing app to set the details for the metal ring. To make it possible to properly create the metal ring when the bird is added to the database, the details for the metal ring can be set after the BirdRing file is imported. To save time, you can have the ringing station automatically set when choosing the ringer (one of the other fields that can be set for a bird). Do this by defining a default ringing station for the ringer by going to Manage MBDB > Observers/Ringers and opening the window for a ringer. Fill in the ringing station in the ‘Default ringing station’ field. As mentioned, the system checks whether or not a bird already exists in the system. It does this for each individual entry in the CSV file. When the CSV file contains the same bird more than once and that bird does not yet exist in the database, the bird is added as many times as it exists in the CSV file. To avoid this scenario, it is advised to only process observations from a single date instead of processing observations that were made over long periods of time. 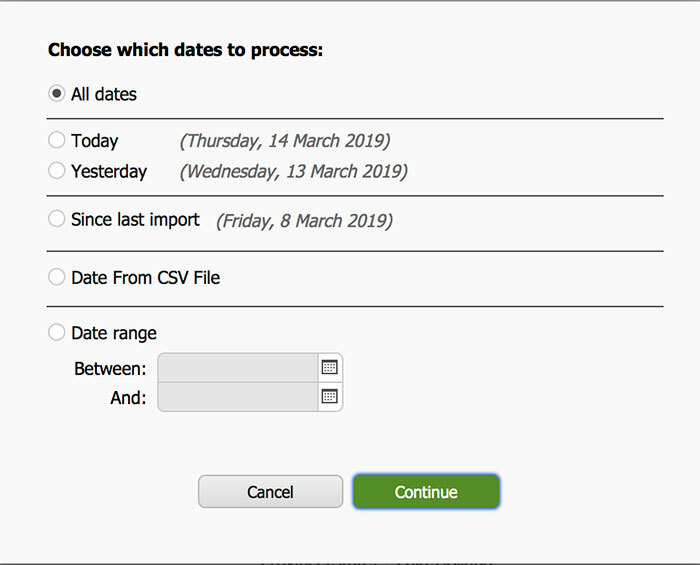 Which date to process can be chosen during the import process. Make sure also to always check the results once the import into the database is done. Should a bird exist more than once, the extra instances of that bird can be removed. All dates. All dates in the file will be processed. Use this with care (see point 3 above). Today. Only observations made today (based on the system date) are processed. Yesterday. Only observations made yesterday (based on the system date) are processed. Since last import. All dates that are more recent than the date of the last import are processed. Use this with care (see point 3 above). Date. Manually choose a date to process. Date ranges. Manually choose a date range to process. Use this with care (see point 3 above). You can control the default setting through Manage MBDB > Preferences > Birdring > Process dates. Send yourself the CSV file. Update the bird and/or observation details. Step 1. From the BirdRing app, send the observations to yourself by e-mail. Step 2. Save the received attachment from the e-mail to your system somewhere. It will be a file with the extension ‘.csv’. You don’t need to open or edit it. Step 1. In the Marked Birds Database, go to the Bird Overview layout and at the bottom of the screen click on ‘Add a Bird with Markers’. The screen appears where you can choose the different methods of adding a bird. Step 2. Under BirdRing import, click ‘Open’. Step 3. Click ‘Browse for CSV file’. 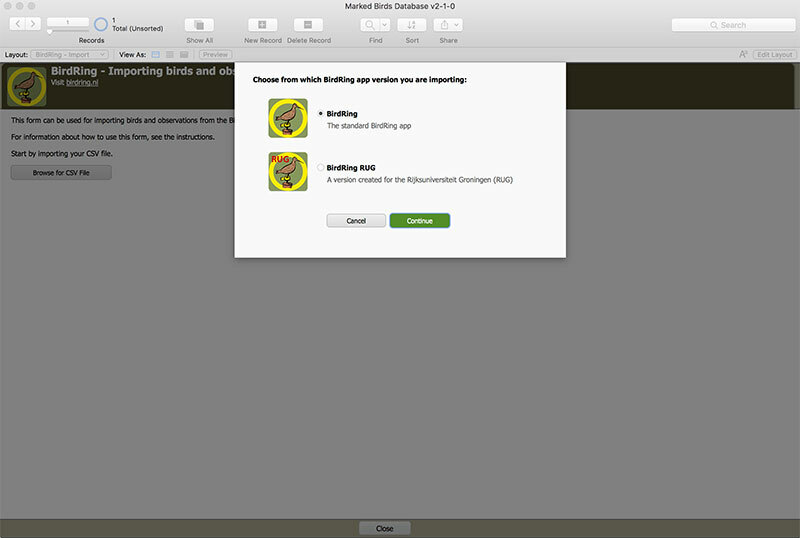 A window appears showing the available versions of the BirdRing app. Step 4. Choose the version from which you sent yourself the CSV file and click ‘Continue’. Step 5. Browse to the CSV file that you saved and double-click it. A window appears showing the possible dates to process. Step 8. Choose an option and click ‘Continue’. The file is loaded into the Marked Birds Database. A check is automatically done to see if any of the birds already exist. 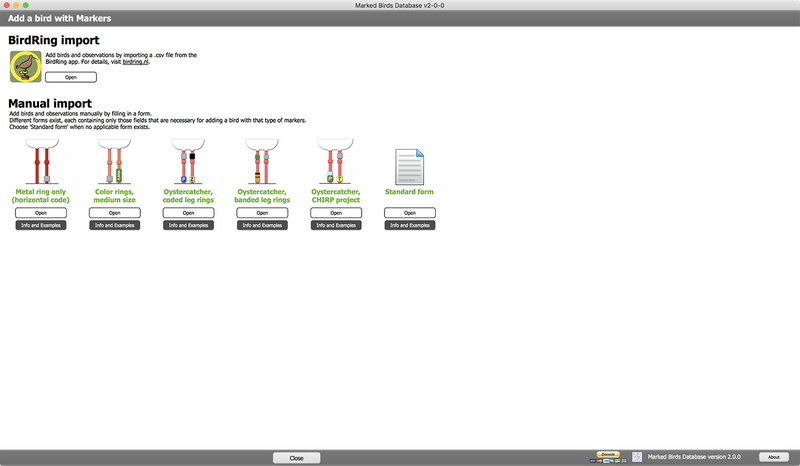 When completed, a summary is shown. Step 9. Click Close to close the summary. Each bird is shown in its own screen. Use the navigation tools in the top left corner of the screen to view each bird. Note that for some birds an image shown displaying how the rings are fitted. This image is referred to as a ‘Visual Display’. Such an image is only available for some projects, when it is not available the Markers are shown in a list view. At this stage of the import, the system has checked if any of the birds in the CSV file already exist in the database. The bird does not exist yet. 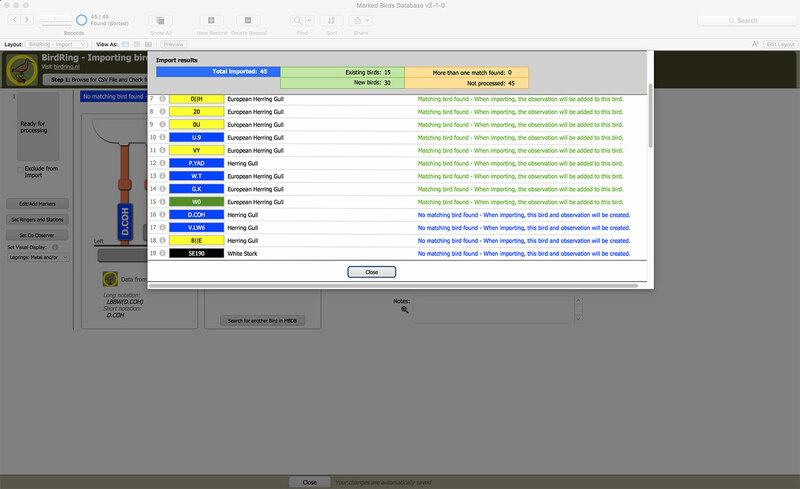 When running the import into the database it will be added as a new bird and the observation will be added to it. One matching bird has been found. When running the import into the database, the observation will be added to this bird. More than one matching bird has been found. All matching birds will be displayed in a list. Before this bird can be imported it has to be matched to an existing bird, or it has to be added as a new bird. For each bird you can also choose to exclude the bird from being imported by selecting the option ‘Exclude from import’ on the left side of the screen. No matching bird found – When importing, this bird and observation will be created. 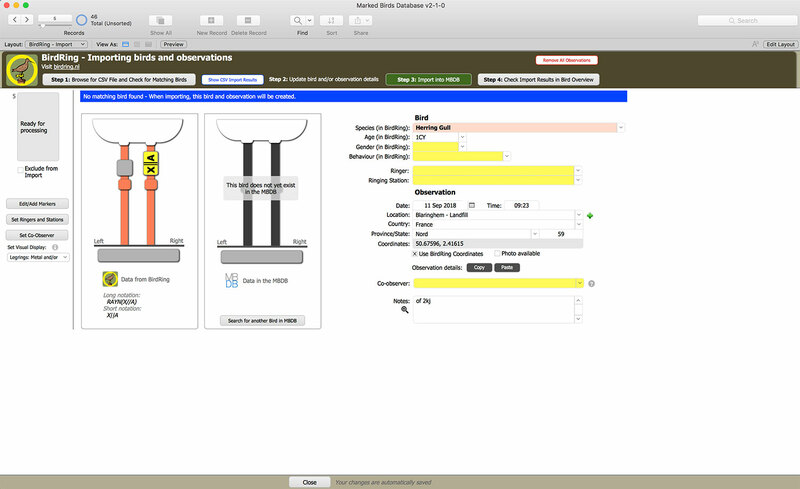 When available, an image is shown displaying how the Markers are fitted to the bird. When no such image is available, the Markers are shown in a list. To make any corrections or to add additional rings, click ‘Edit/Add Markers’. If you think that a bird does exist in the database, manually match it by clicking ‘Search for another bird in the MBDB’. Matching bird found – When importing, the observation will be added to this bird. The display on the left shows how the bird was entered in BirdRing, the display on the right shows how the bird exists in the system. Compare the details of what has been entered in BirdRing with the details of what exists in the MBDB. 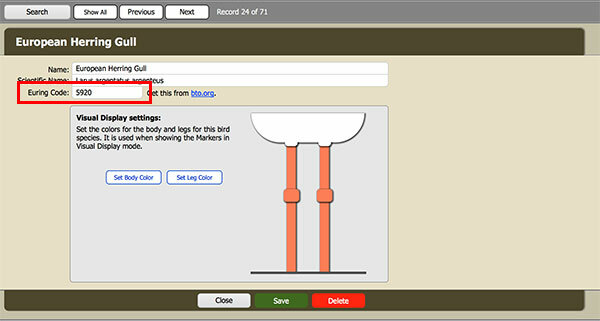 If you think that the bird is incorrectly matched and does not yet exist in the database, click ‘Add as New’. If you think that the bird should be matched to a different bird in the database, manually match it by clicking ‘Search for another bird in the MBDB’ and follow the steps. When matching the bird to a bird that exists in the MBDB, closely compare both images to see if the Marker position, reading direction, and code match with each other. Note: For medium Markers (such as those fitted on gulls), any mismatch in Marker position, reading direction, or code is indicated by a red warning icon. Hover over the icon to see a tooltip with information about what is incorrect. 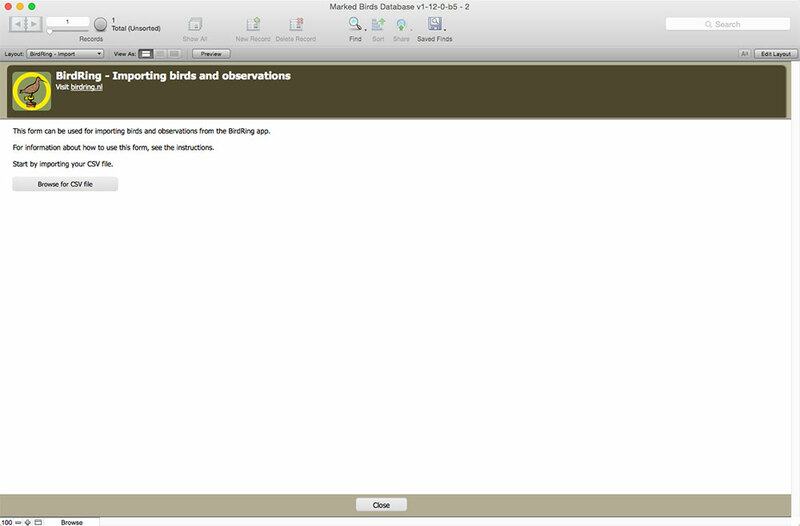 If needed, update the information in the MBDB by clicking ‘Open in Bird Overview’. Once the changes are made, close that window to return to the BirdRing screen. 2 matching birds found. Select a match, search for another bird, or add the bird as new. This can occur when more than one bird is found that has the same combination of ring color and code fitted. Note that when searching for a match, the database does not search on bird species. Even though this might give strange results where birds of completely different species are found, this will prevent a bird from being added when it already exists as a sub-species or as a similar (but different) species. Example 1: a Lesser Black-backed Gull is entered in the BirdRing app but exists in the database as a Nordic Lesser Black-backed Gull or Baltic Gull. If the search would include the species, it would not find the Nordic or Baltic Gull and would incorrectly add the bird as new. Example 2: a juvenile Herring Gull is entered in the BirdRing app but exists in the database as a juvenile Lesser Black-backed Gull. If the search would include the species, it would not find the Herring Gull and would incorrectly add the bird as new. All matches that have been found are shown in a list. If the correct bird is in the list, click ‘Use this Bird’. If you think that the bird should be matched with a different bird, click ‘Search for another Bird in MBDB’. If you think that the bird does not yet exist in the database, click ‘Add as New’. When the bird is linked to a matching bird, an image is shown displaying how the Markers are fitted to the bird. The display on the left shows how the bird was entered in BirdRing, the display on the right shows how the bird exists in the system. When no such image is available, the Markers are shown in a list. Compare the details of what has been entered in BirdRing with the details of what exists in the MBDB: closely compare both images to see if the Marker position, reading direction, and code match with each other. 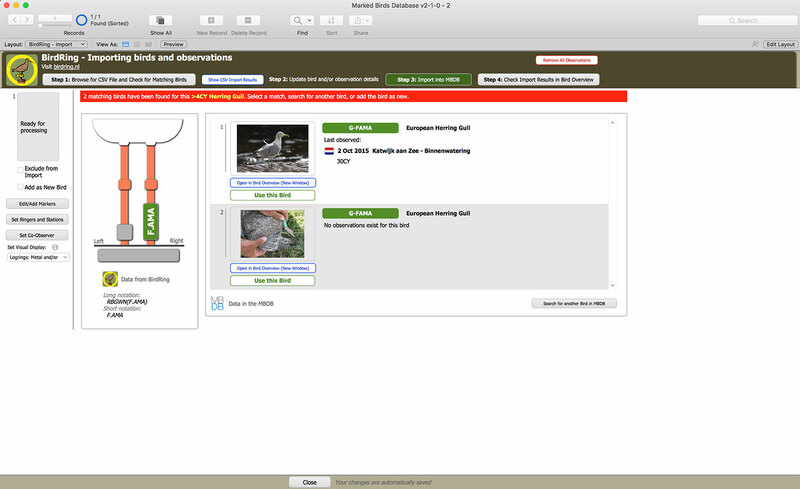 The observation details that have been entered in the BirdRing app are shown on the right of the screen. For each field, check if the correct information is entered. Any field that needs attention is colored yellow. However, it is not mandatory to add information to these fields. Depending on the scenario, some fields cannot be filled in. These fields are colored gray. For example: when a matching bird is found, the fields ‘Gender’, ‘Ringer’ and ‘Ringing Station’ cannot be filled. This is to prevent that data that exists in the database is overwritten with incorrect data. 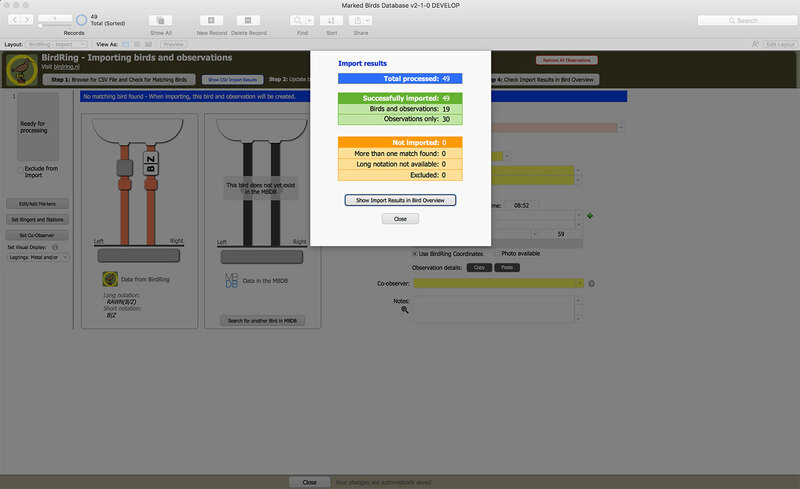 Quickly changing the location settings for multiple observations can be done by clicking ‘Set Location’. 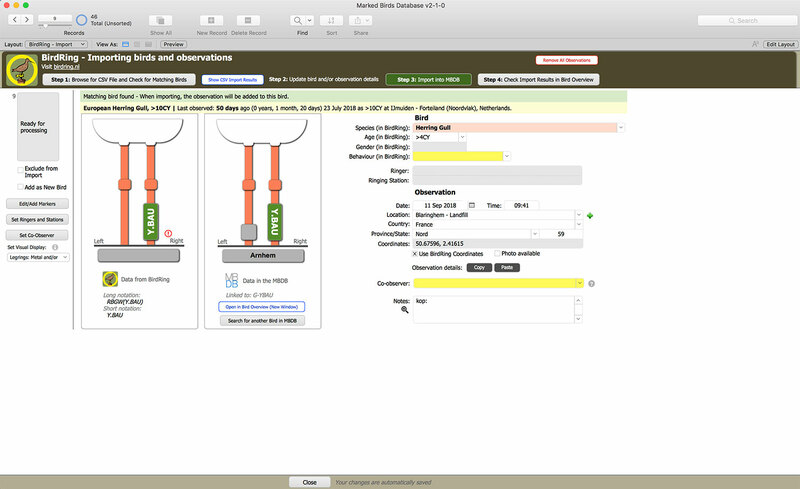 When each bird and its observation is checked and optionally updated, the data can be imported into the database. To do this, click ‘Import into MBDB’. When the process is completed, a summary is shown. Once the import is completed, it is advised to check the results. Do this by clicking ‘Show Import Results in Bird Overview’ in the summary, or when the summary is closed by clicking ‘Step 4. Check Import Results in Bird Overview’. This will open the Bird Overview layout and show all birds for which data has been entered. Check that the data has ended up with the correct bird. While in the Imports screen, the Find option can be used to quickly find a bird that you are about to import or to search for all birds with a particular status such as ‘Matching bird found’. Alternatively, click ‘Show CSV Import Results’ and click the info icon in front of the bird that you want to view. The following tips will help in filling various fields automatically, thereby saving even more time. If you are entering a bird in the BirdRing app at a location that is also stored in the database (Manage MBDB > Locations): try to enter the name from the database as the location name in the BirdRing app. When importing the BirdRing file, all details for this location (country, province and coordinates) will then be automatically filled. When entering an observation in the BirdRing app, for some projects the details for the metal ring cannot be set. During the import of the BirdRing file, a metal ring is automatically generated for that position after which the codes are removed from the remarks field. When many new birds are to be imported, setting the ringer and ringing station for them can be easily done by clicking ‘Set ringers and Stations’. 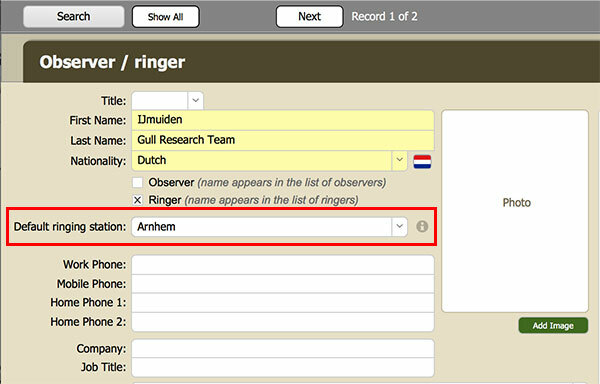 Search for all birds for which you want to set the ringer and ringing station. Enter these at the top of the screen and click ‘Replace’. Repeat when necessary.